5G technology is now ready to be deployed and will have a big impact on the implementation of autonomous and connected driving as well as on the Internet of Things. According to inCITES Consulting, author of the Europe 5G Readiness Index, “5G has become the new arms race between the different nations, which are desperately trying to claim leadership in 5G for their own reasons”. However, a country’s readiness for and ability to implement 5G depends on a number of economic, operational and social factors. The 5G Readiness Index provides an overview of how ready different European countries are to implement this key technology for the future. 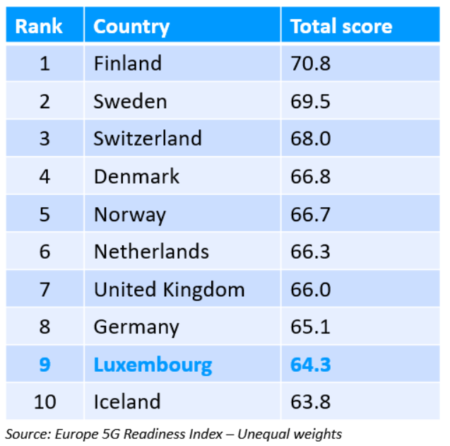 Luxembourg ranks 10th in the overall index, or 9th if the index is weighed according to the importance of major criteria. The country ranks 1st in the Country Profile category, a feat that is largely due to the government’s strong ICT vision. The country also ranks between 1st and 7th in 6 out of 7 criteria for Regulation and Policy, a category that includes factors relating to the regulatory and policy frameworks that will be key to facilitate the smooth and swift deployment of 5G networks. It is top-ranked in both the effectiveness of law-making bodies and laws relating to ICT criteria. This highlights Luxembourg’s capability to make the necessary regulatory interventions needed for 5G to flourish.